Having a casino party is a great way to make your next event a fun and memorable experience. Guests can try their hand at one of our Black Jack, Roulette, Poker or Craps tables. It’s all for fun so no money is exchanged and your guests will have a great time. Fun for all. Great for your next party or outing. Different inserts let you change to Roulette, Craps or Poker. 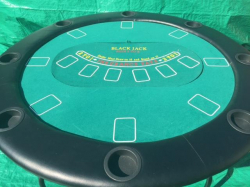 Includes Poker/Craps table, Roulette Table, additional Craps and Roulette mats, Jumbo Playing Cards and a Giant Jack Playing Card Decoration!